Faras Thirano is a Dunmer enchantress located in the Lower Level of the Tower of Dawn, Ghostgate. 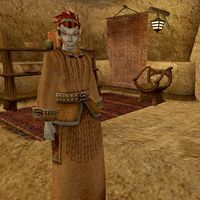 She is the only merchant in the game who sells Indoril helmets or pauldrons. She is wearing a common robe with matching shoes. Aside from her natural resistance to fire and the sanctuary provided by her ancestors, she knows the following spells: Sleep, Wearying Touch, Distracting Touch, Wild Distraction, Deadly Poison, Poisonbloom, Viperbolt, Lightning Storm, Dire Weakness to Fire, Dire Weakness to Frost, Dire Weakness to Magicka, Dire Weakness to Poison, Dire Weakness to Shock, Calm Creature, Calm Humanoid, Sotha's Mirror, Vivec's Feast, Spell Absorption, Drain Blood, Blood Despair, Skylamp's Shadow, Seryn's Blessing, Strong Resist Fire, Strong Resist Frost, Strong Resist Magicka, Strong Resist Poison, Strong Resist Shock, Restore Intelligence, Restore Speed, Restore Willpower, Dispel, Daedric Bite, Frost Bolt, Frost Storm, Detect Creature, Shadow Weave, Cure Common Disease Victim, Vivec's Wrath, and Weakness to Corprus Disease.